Shackles are used in many applications in many industries. The most common shackles in our industry include the following: screw pin anchor type shackle, bolt type anchor shackle, screw pin chain type shackle and the bolt type chain shackle in either carbon or alloy steel. There are also specialty shackles like wide body shackles as well as shackles for use with synthetic slings which are great for use when the job requires something other than one of the more common shackles described above. When buying shackles, ensure you buy a brand-name quality product that meets or exceeds the industry standard. At a minimum, a shackle should have the Manufacturer's Name/Logo on each shackle and pin, the size, the work load limit, traceability in case of a recall and the load pins must be alloy. Never interchange load pins between different shackle manufacturers. Screw pin shackles are used when picking and placing of loads. When using screw pin shackles, it is imperative to hand tighten the load pin as minimum and to NEVER loosen or back-off the pin so it is easier to remove after the lift is complete. Always have it hand-tightened at a minimum, but even better is to use a wrench or a screw driver through the pin's hole in order to ensure it is fully engaged and tightened before lifting the load. Should you need to use screw pin shackles in long term or semi-permanent application, you should mouse the shackle load pin to the shackle body using steel wire to prevent the pin from disengaging under vibration or for any other cause. As long as the wire is in tact, you know the shackle pin cannot disengage. For more complete information on "mousing" shackles, please contact us at any time. 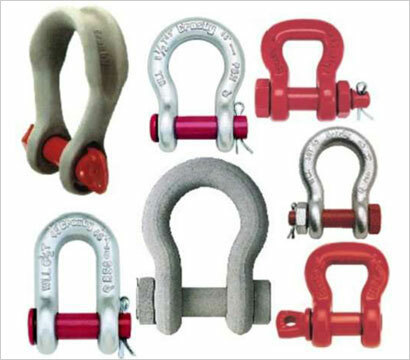 Of course using a bolt type shackle would be the preferred product to use in long term/semi permanent applications. Crosby can also provide a torque specification for their shackle pins if required. Click on the appropriate link below to see Shackles for your specific application.